WITH the very minimum of fuss, Carlow opened their account in Division 3 of the national football league on Sunday with a win that was every bit as commanding as the seven-point margin would suggest. 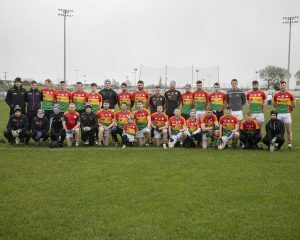 The win was constructed around the solid game-plan which has seen Carlow make strides in league and championship over the past two seasons and they had far too much composure and assurance for a Sligo team who disappointed throughout. The usual rules applied. Carlow played with 14 men behind the ball when not in possession and stifled countless Sligo attacks before they even got inside the 45-metre line. Carlow were excellent when getting a hand in to disrupt play and turn over possession. When Sligo played the ball a little more directly, the last line of the Carlow defence inevitably came out on top with Daniel St Ledger and Chris Crowley, in particular, to the fore against their opponents. Further up the pitch, Carlow moved the ball patiently when Sligo had men behind the ball, but they did break at pace and caused Sligo serious problems when the opportunity arose. As early as the half-hour mark the die was cast when a Paul Broderick 45 fell short beneath the crossbar but the Sligo defender who reached up to claim possession allowed it to slip through his grasp and into the net. That goal opened up a 1-5 to 0-2 lead and Sligo’s lack of attacking threat meant it was always going to be difficult for them to claw back such a deficit. Indeed, Sligo didn’t score a point from play until the 37th minute of the second half, everything else coming from frees (0-4) and marks (0-2). Perhaps the most striking aspect of the game was that Carlow have very little to fear in this division if Sligo are any measure. Now in their eighth consecutive season in the third tier the Connacht county are the very definition of a Division 3 team but Carlow showed that a physically strong team with a well-defined game-plan and a little cutting edge up front can prosper. Paul Broderick got the home side off the mark with a lovely trademark score, lofted over from 35 metres inside a minute. Eoghan Ruth took his score well from out on the right to double Carlow’s lead three minutes later. Throughout the half, Carlow kept the scoreboard ticking over with Brendan Murphy’s point, driving forward to shoot over from distance on 21 minutes, a highlight. Probably the best score of the game came on 33 minutes when Brendan Murphy won a great ball in midfield, popped it to Jordan Morrissey charging forward and Paul Broderick took the pass on the overlap to slot a cracking point. That, along with the fortuitous goal and a couple of Broderick frees, brought their first-half tally to 1-6. Sligo relied on intermittent frees from goalkeeper Aiden Devaney, Niall Murphy and Sean Carrabine to leave them trailing by six points at the interval. Sligo needed to lift their performance level seriously after the break if they were to make a game of it but a Darragh Foley free extended Carlow’s lead after five minutes. There was a mini-revival from Sligo when they scored three on the trot between the ninth and 18th minutes of the second half to make the score 1-7 to 0-6. But they were shooting poor wides too, often from distance with players who looked to be seriously lacking in confidence. Carlow needed to settle the game and another Darragh Foley free followed by a nice score from Sean Murphy with 15 minutes to go pretty much sealed the result. With 12 minutes to go, Sligo’s Darragh Cummins was shown a straight red for a strike on Jordan Morrissey to close out a poor day for the visitors. On this evidence, new manager and former Sligo great Paul Taylor has a lot of work to do to lift confidence and performance levels ahead of their next game against Down; another team to lose in week one. Carlow closed out the game impressively with Eoghan Ruth scoring a second following tenacious play by Sean Gannon and Morrissey up the right wing. Then sub Shane Clarke drove straight at the heart of the Sligo defence and was pulled down. Broderick did the usual from the free. It was a fine start to the league season for Carlow, and there was plenty in the performance to suggest there’s more to come.